Nutrition Maker is a cloud based meal planning software program for dietitians, nutritionists, medical wellness and related nutrition professionals. 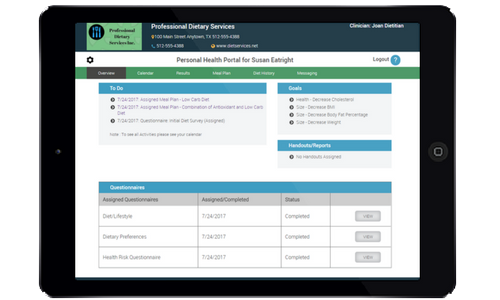 Our easy to use comprehensive software tracks patient bio-metrics, assesses health risks, provides custom tailored meal plans, and obtains patient diet history analysis. Combined with a personalized HIPAA compliant patient access portal, complete with messaging, the result is a modern patient engagement platform. Contains over 1400 days of Dietitian designed meal plans in a variety of areas such as meals in minutes, anti-oxidant, mature adult, gluten free, low carb, sports/endurance, high energy, vegan, vegetarian, low sodium, ethnic and more. Meal plans have a summary and description and include recipes and shopping lists. 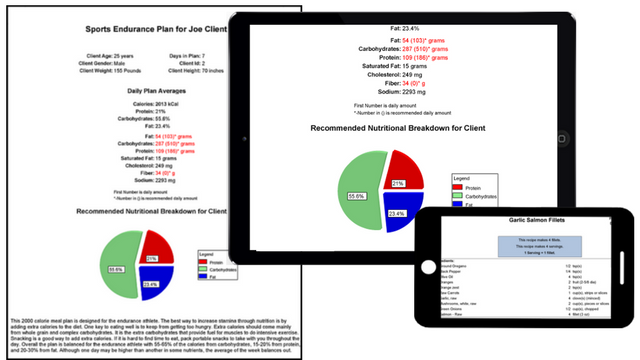 Nutrition Maker makes meal planning easy by automatically determining the amount of calories your client needs to achieve their weight goals using a detailed BMR equation, based on client age, gender activity level current weight and target weight. No meal planning software would be complete without recipes. Nutrition Maker has hundreds of recipes to create healthy, tasty and enjoyable breakfasts, lunches, entrees, snacks and deserts. Each recipe is easy to follow so your client can prepare the meal plans you provide. And of course every meal plan will provide your client with a complete shopping list, so they can easily have all the ingredients on hand to create their healthy meals. The end result is our pre-made recipes make your job easier while helping them achieve their nutrition goals. 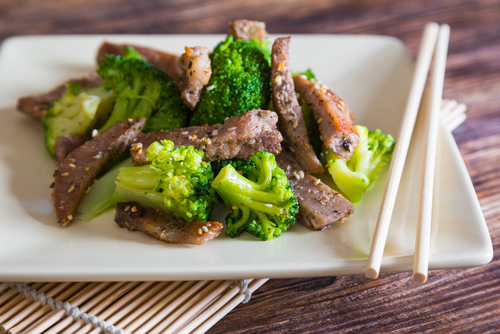 Over 25,000 foods included in our food database make it easy to adapt meal plans to any clients needs. This meal planning software includes not just the USDA food database, but also databases from Canada, the UK, and Australia. And on top of that, we have added many popular foods and dishes from major restaurants, grocers and food manufacturers. Continual and periodic food database updates ensure you will always have the food choices you need. "My clients really like getting their meal plans on the internet." 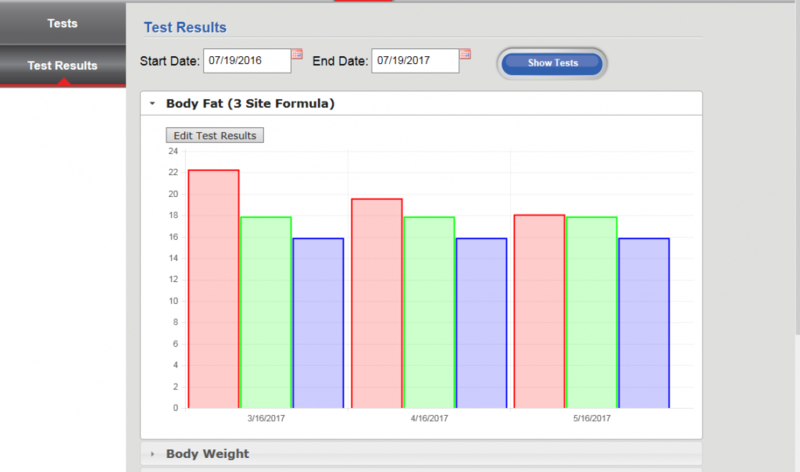 Track your clients weight, body fat percentage, BMI, lean body mass, waist to hip ratio, girth measurements, and cholesterol. Additionally you can track a variety of other tests and surveys related to nutritional goals such as reducing snacks, lowering sodium consumption, increasing calcium intake and more. Nutrition Maker has a complete set of nutritional goals to help you and your client to achieve the results they want. 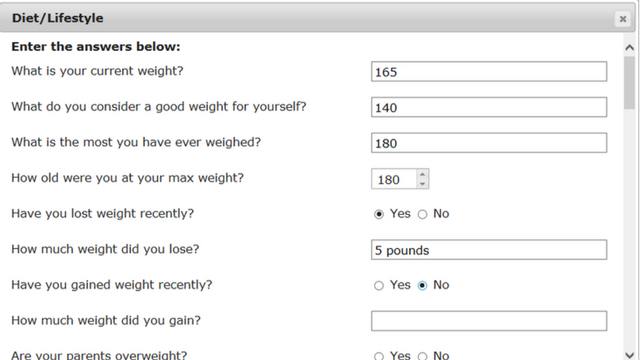 The software will track goal achievement and recommend tests based on the selected goals. We make is simple to save you time and effort. Even the most adept nutrition professional can have difficulty knowing if the client is getting the right nutrients and vitamins. It’s impossible to look at a person and know they aren’t getting enough vitamin A or E, or if they are low on potassium. Ever wonder how to know that for sure? We can help. Simply instruct your clients to keep a food diary for 3-5 days. 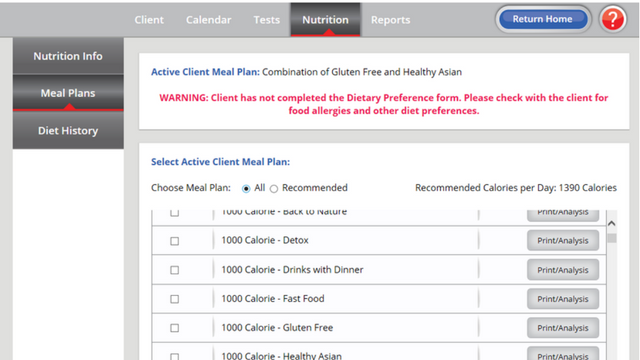 They (or you) enter that information in the diet analysis section and the resulting report provides Carb/Fat/Protein percentages and a list of any nutrient deficiencies. Diet analysis can provide an additional source of revenue or be included in your basic services. It doesn’t stop there; the system will even give you a list of foods that contain the nutrients your client needs, and will provide a report that shows excesses (fat, sodium and cholesterol are the usual culprits). Questionnaires include health risk assessments, diet preferences, lifestyle surveys and more. Also included are informational handouts such as nutrition guidelines, fiber sources, stress management etc. Providing informational resources is a great way to keep clients involved in their healthcare as well as educating them properly. 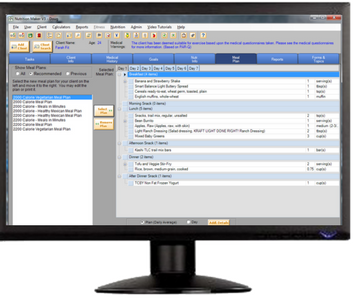 You have the ability to print the reports or have the client access them on their health portal. 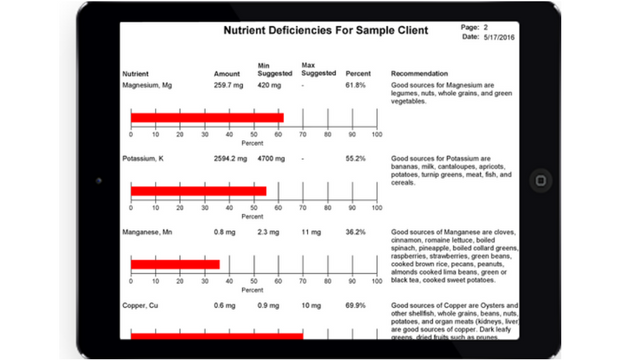 Nutrition Maker also has the ability to create a variety of printed reports for your clients, including test summaries, health risk reviews and more. View test results and goal acheivment. 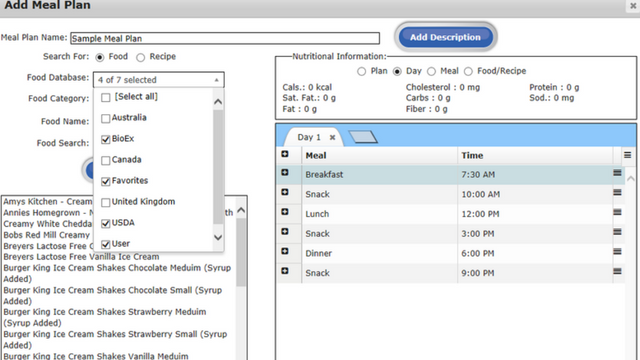 Retrieve meal plans, use their shopping list, and see recipes. Receive information documents or fill out forms. We make it easy for you to keep a good return on investment. You pay only for the number of clients you are treating. Just starting out? Not a problem. Start with our Starter Package of only 5 clients. As your business grows you can easily move up to the next tier and add more client slots. If a client no longer uses your services, you can use that client slot for a new client. With prices as low or lower than $3 per client/month, you can see how simple it is to pay off your investment (as long as you charge more than $3 per month for your services). For more information on ROI see How It Works. We also offer annual plans which can save from 15-30%. Versatility is key. Not every health professional is the same. Not every client needs the same things. We don’t think a nutrition software should lock or push anyone into any specific method. That is why we let you provide your care with printed test reports, meal plans, forms, handouts, diet analysis or let your client access the information on their portal. We are here to make your job easier and your business more profitable, not to tell you how to run the details of your business or your nutrition duties. Add your logo to handouts and online portal. Add your own meal plans. 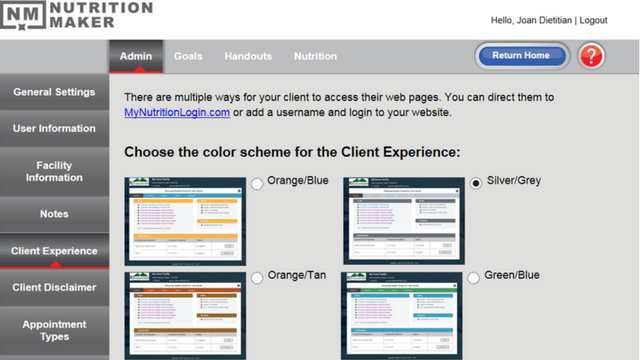 Change color scheme on client portal to match your preference. "I was surprised how easy it is to use. I am not very good with computers, but it really is fast. The free training and customer support was awesome." "I used to spend hours putting meal plans together plus trying to make a shopping list was next to impossible and never very good." We offer support by phone or email. We offer training by video tutorials or online training sessions. No extra cost for new features. No long term contracts. Cancel at any time prior to renewal with no questions asked. 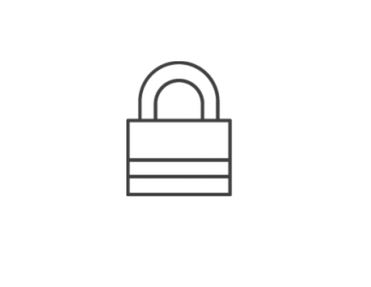 Secured by the most current encryption systems used today. Password protected for clinician and patient. HIPAA compliant. Data backed up on multiple servers with additional redundant storage. Licensed by client, either monthly or annual.No fees for multiple locations. No set up fees. We offer discounts for members of professional associations like The American Nutrition Association and many others. If you are a member of an association, contact us for discount opportunities. Eliminates IT labor costs. Eliminates server hardware and upgrades. No software to install. 24/7 access. Works with Windows, Mac, Android, iPad and smart phones. If you are a personal trainer looking for a system for testing, video exercise and nutrition, check out our complete online personal trainer software, Total PT Fitness.